I first became aware that there was a category of art called "outsider art" in the late 80s. I was moving from Los Angeles to Seattle, read about an Adolf Wölfli exhibit at Berkeley and decided to take a detour to check it out. I was spellbound by it and by the whole idea of an artist somehow completely cut off from any other art, whether the kind of art one studies in school or traditional folk art. This feeling was deepened in 1990, when Raw published a selection of work by Henry Darger. I thought I had a clear idea about the demarcations between outsider art, folk art and mainstream art. Outsider artists were people who were almost completely cut off from access to other art--asylum patients like Wölfli or Martin Ramirez, or "hermits" like Darger. Folk artists were artists who worked out of a folk tradition, where techniques and conventions were passed orally from master to apprentice. And "mainstream" or "cultural" artists were artists who had access to art schools and museums. But these handy categories break down the more you think about it. Forrest Bess and Charlie Stagg feel like "outsiders" of the hermit type because they chose to live and practice their art in remote locations away from the influence of mainstream art. But in both cases, they were neither real hermits (they had plenty of contact with other people, including people involved in art), nor were they in any way ignorant of current mainstream art practices of their time. And before Thornton Dial was "discovered," he had claim to be an outsider artist, but since that time he has seen a lot of other art in museums and knows that there are painters and sculptors whose work is superficially similar to his. Additionally, the romance of the outsider artist as coming from a completely different mental state, being a visionary, being insane, falls apart once you leave the Wolflis and Dargers behind. I recently read three very different books that serve to illustrate the ambiguities of outsider art. 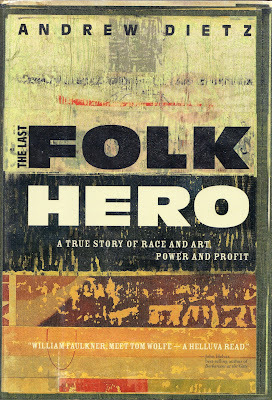 The Last Folk Hero: A True Story of Race and Art, Power and Profit is a book-length piece of journalism from 2006 that deals with the relationship between a dealer/collector and the outsider artists he discovers and represents. The Genius (2008) is a novel about what happens when a contemporary art dealer in Chelsea accidentally discovers a trove of art by a seemingly deceased outsider artist, and Charles Dellschau (2013) is a giant art book about the German-American painter of airships. William Arnett was an Atlanta dealer who specialized first in Mediterranean antiquities, then Asian art, then African art. But his life changed when he became aware of a couple of self-taught African American artists, Jesse Aaron and Sam Doyle. But that wasn't all. He was a dealer, after all. His notion was essentially one of arbitrage--take an asset (a piece of art) that is extremely undervalued in its current market or environment and sell it in a market when and where its "true" value can be discerned. He wanted to take these objects out of poor people's front yards and put them in a gallery. This is what is so delicious about this book. Is Arnett an exploiter? Is he harming the artistic value of these objects by taking them out of their folk world and turning them into capitalist assets? These and many other issues are implicitly and explicitly discussed in The Last Folk Hero. And Arnett is not the only character in the book--the artists, particularly Thornton Dial and Lonnie Holley, are major characters. Thornton Dial, Blood and Meat, 1992 , Mixed Media on Canvas, 65" x 95" x 11"
Arnett searched out art all by self-taught artists all over the South. Lonnie Holley's sculptural work had been bought (and even stolen off his lawn), but when he met Arnett, he felt respected as an artist, perhaps for the first time. He was no longer a freak but a part of an art world. Arnett represented him and helped him achieve financial success and recognition. And Holley became a scout for Arnett. Thornton Dial was one of Holley's discoveries. The quilters at Gee's Bend were also Arnett discoveries. And Arnett didn't just represent these artists as a dealer--he was a tireless promoter of them to museums. He worked hard to get critics and museum curators and directors to see the value in this work. In doing this, he managed to alienate much of the Atlanta museum establishment, but outside Atlanta, he was very successful. 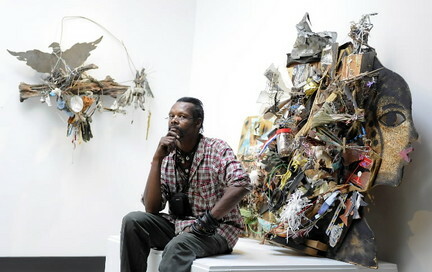 Working with Thomas McEvilley, he got Thornton Dial simultaneous shows at the Museum of American Folk Art and the New Museum. Peter Marzio put on an exhibit of the Gee's Bend quilts at the MFAH, which ended up traveling the country for years subsequently. But there was always a hint of exploitation about Arnett's relationship with these artists. For example, Dial was able to move out of his modest home in a rough neighborhood into a larger house on a huge lot, but the house was owned by Arnett. Arnett had a somewhat paternalistic relationship with many of his artists. And in a way, how could it have been otherwise? Until Arnett showed up in their lives, many of them had had almost no contact with the white bourgeois world. It wasn't like they were going to engage with a lawyer to represent them in their dealings with Arnett, even though they certainly should have. This came to a head in 1993 when 60 Minutes did a hit piece on Arnett using Dial as the bludgeon. According to the book and by many other accounts, it was completely unfair. Arnett believes that his many enemies (he was accomplished at making enemies) in the Southern art world were informants to 60 Minutes. 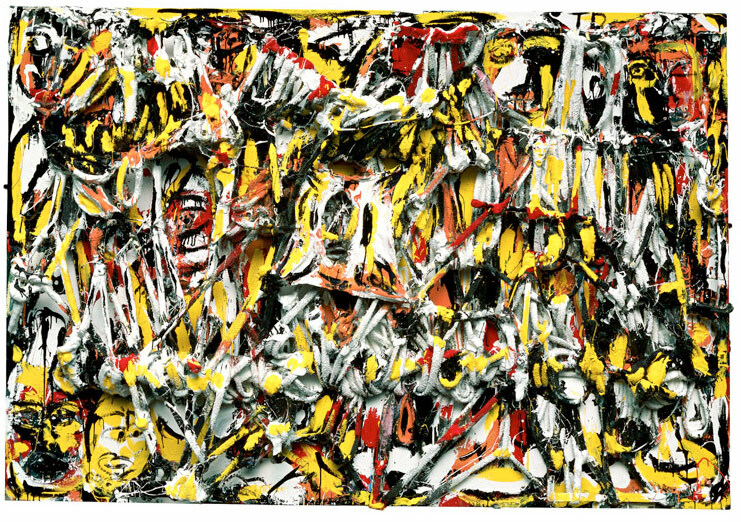 Certainly many participants in that world feel that Arnett pushes museum shows so heavily in order to increase the value of his own holdings--and it's hard to argue with the fact that when Thornton Dial gets a retrospective, Bill Arnett's collection become more valuable. In any case, while there is paternalism in the way Arnett deals with his dealings with these folk artists, the fact remains that many of them would still be doing lawn art if Arnett had not doggedly searched them out and created a market for their work. Furthermore, Arnett has repeatedly risked his own money to promote and support this art. The cost of printing the two volume Souls Grown Deep, an encyclopedic compendium of African-American vernacular art, was staggering. We should bow down to Thornton Dial for is art, but we should also thank Bill Arnett for helping to make it possible for us to see it. The book is well-written but eccentric. Andrew Dietz is neither a scholar nor a journalist (he is apparently a business consultant), and has no other writing credits that I can determine. The book itself lacks both an index and a bibliography, both of which make it hard for the reader to track down other sources for this information to independently verify it. That said, there is nothing that says you have to be a professional writer to write a good book, and what I could track down (using good old Google) more-or-less confirmed the information in the book. And it certainly is not a hagiography of Arnett, who in addition to being portrayed as a paternalistic figure with regards to the artists he represents, is also shown to be difficult, controlling and paranoid. 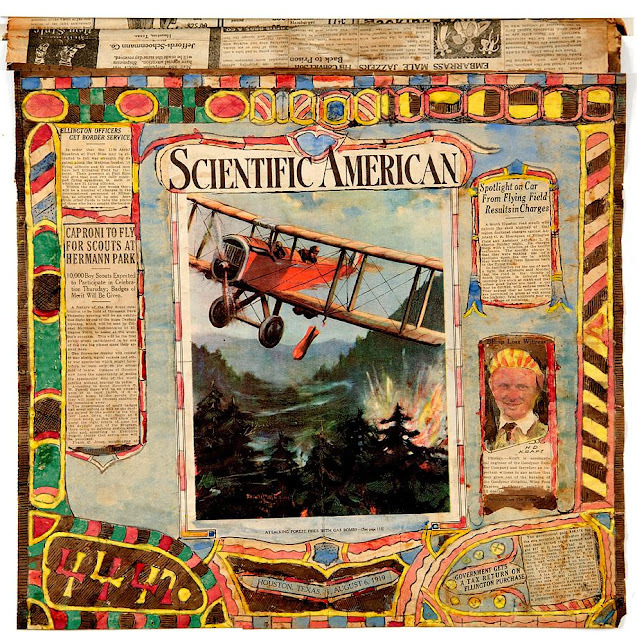 There are interesting issues when folk or outsider art is "discovered" by the mainstream. The Last Folk Hero deals with them well by telling a particular story (as opposed to taking a birds-eye view and discussing the issues more abstractly or theoretically). I found it fascinating and compelling. 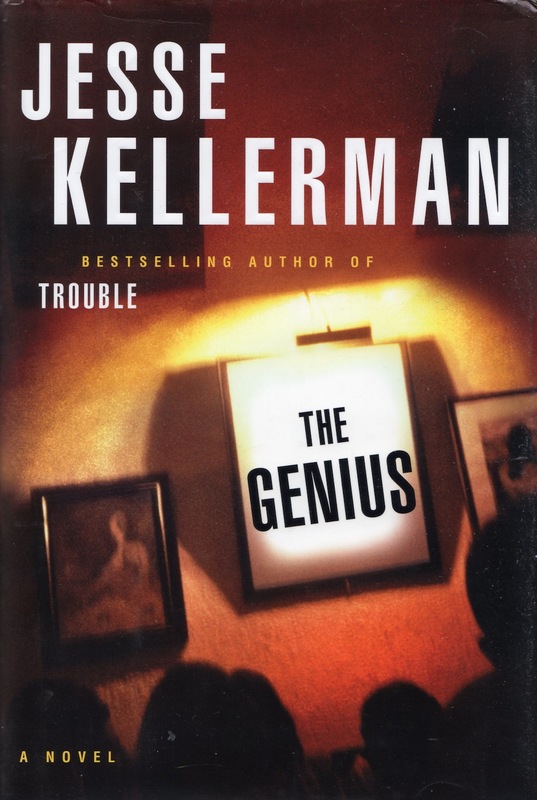 Jesse Kellerman's The Genius deals with similar issues through the bizarre lens of crime fiction. Ethan Muller is a Chelsea gallerist who is struggling to be successful. It's funny how gallerists in pop culture are always depicted as wildly successful. The reality that running a gallery is a difficult business with a high failure rate is acknowledged here. A scion of a rich family, he is estranged from them and determined to make a success on his own. But when his father's right hand man tells Ethan about finding a treasure trove of outsider art in an apartment in a large housing complex (built by the Muller family many decades ago), he is willing to take a look. This is how he acquires the work of Victor Cracke, a man who has seemingly disappeared. 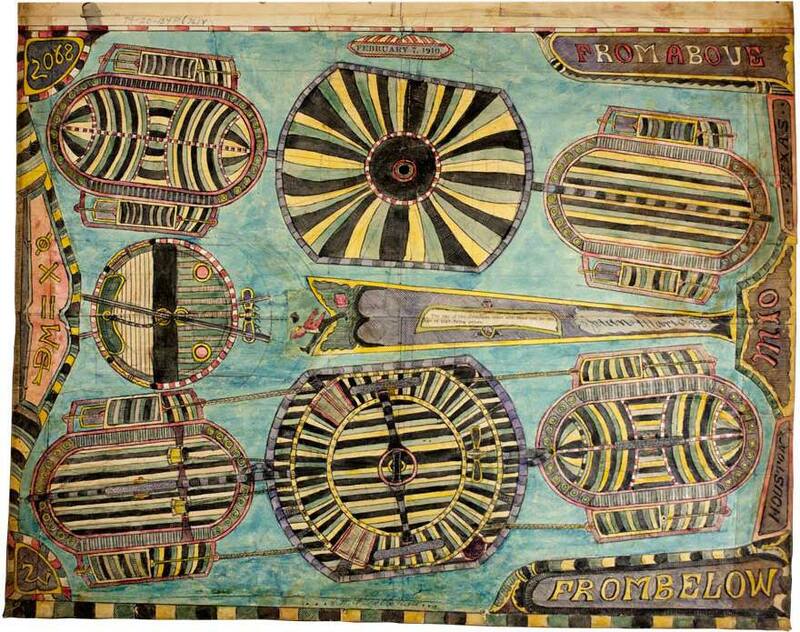 Kellerman is deliberately echoing the story of the discovery of Henry Darger's work. Darger was a tenant in a building owned by photographer Nathan Lerner, who lived in a house next door. The essential difference is that while Lerner didn't know what Darger was up to for most of his life (Darger was already a tenant when Lerner bought the building), he found out about Darger's art while Darger was still alive, when Darger was forced to move out due to health problems. (Lerner seems to have been an ideal landlord--he even lowered Darger's rent at one point.) Darger gave the work to Lerner, and Lerner didn't try to publicly display it until four years after Darger's death in 1973. Muller, on the other hand, instantly recognizes Cracke's genius, takes the artwork (despite the fact that Cracke is still alive, as far as Muller knows) and prepares to show it immediately. He almost instantly sells some of it for a huge price to wealthy client. Muller is opportunistic and unethical, but Kellerman's portrait of him is more nuanced. He doesn't just see Cracke as a cash cow (although it is the perfect cash cow for a gallery--work that can be sold at a high price with the gallery keeping 100% of the revenue), but also deeply loves the work. He's obsessed with it. I think this is the paradox of gallery owners (and book publishers and film producers and many other kinds of artistic impresarios). They want to make money--indeed, they want to get rich--but they also love the art. Sometimes these two impulses work in perfect harmony, sometimes they are in conflict with each other. Kellerman does a good job depicting this conflict. There is some typical crime novel stuff--threats, a little violence, etc.--and Muller ends up researching Cracke with a retired police detective and his assistant DA daughter when it starts to look like Cracke may be linked to some horrific unsolved murders (which, when the word gets out, makes the art all the more valuable). And in the end, Muller leaves the art world behind in a way that feels like a moralistic judgment on it and seems to forget that there is a reason people love art. But let's face it, crime fiction's ultimate weakness is that the endings are usually pretty unsatisfactory. Everything that you enjoyed up to the end--the unsolved mystery, the danger--goes away as the bad guys are caught or killed and the mystery solved. Despite that, Kellerman is able to deal with a lot of the issues dealt with in The Last Folk Hero in The Genius. I sometimes get the feeling that the art world is estranged in some ways from the world of fiction. But to me, fiction is one more way--a very good way--to think about things like this. The story of Nathan Lerner and Charles Darger is fascinating. But Kellerman can take a lot of the messy reality of that story and streamline it into a means for really examining the issues of outsider art, the art market, etc. In a sense, fiction is a hypothetical example. (Of course, it's also much more than that.) The Genius is not a great book, but it's worth reading if you're interested in some of the ethical and artistic issues surrounding outsider art. The path of discovery of outsider artists is one of the subjects common to the first two books. Charles A.A. Dellschau, the subject of a huge color monograph and the story of his discovery as an artist in truly strange and circuitous. Dellschau was born in 1830 in Brandenburg, Prussia. He immigrated to the U.S. when he was 19, presumably coming through Galveston, the entry port for many German immigrants. He settled in Richmond, Texas, where he worked as a butcher's assistant. Sometime during the 1850s, he moved to California for four years. He returned to Texas and worked as a butcher. He married a widow, but she and his young son died in 1877. About 10 years later, he moved to Houston and lived with his stepdaughter and her husband. He worked as a clerk for the Stelzig Saddlery Company (which was in business until 2004, amazingly enough) and then retired in his late 60s. Then he started recording the events of his life in a pair of memoirs and 12 large albums of drawings (it seems he may have drawn at least 10 more albums worth of pictures, but they have been lost.) 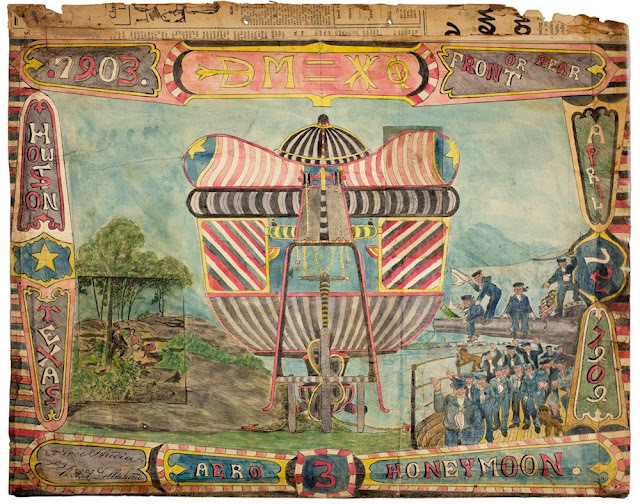 He focused on his California years, where he claimed to be a member of the Sonora Aero Club, a group of men who discovered means for building airships. He worked on these from 1908 until 1921. He died in 1923. The albums remained in an attic in the family home for 40 years. After a fire elsewhere in the house, the family was told to clean out the attic by a fire inspector. They were then left in the gutter, where they were picked up (presumably along with other detritus from the attic) and sold to a junk shop, the OK Trading Post. It was at this point that people started to recognize them as art. Four of the books were purchased by the Menil Collection. The other eight were purchased by P.G. Navarro, a commercial artist who had an interest in airships. Navarro spent many years studying the books, trying to determine if the stories of the Sonora Aero Club could be true (he quite reasonably concluded that they couldn't, but he thought that some of Dellschau's plans for airships were plausible). The images start off fairly matter-of-fact and grow more fanciful over time. In one of the essays in the book, Thomas McEvilley writes, "Dellschau's early work may strike one as pragmatic and technical, while in the later work it seems he is either losing his mind or becoming an artist." The book has six essays in all, and they tend to be quite repetitious, looking at Dellschau from slightly different angles. The best is by Thomas McEvilley--it may have been his last essay. He has obviously studied not only the work of Delschau, but also the extensive and eccentric annotation by P.G. Navarro. He succinctly tells Dellschau's story and does his best to situate the art in a comprehensible space. We can't recognize Dellschau as an artist until the right person at the right time sees it. In 1923, in Houston, this is not art. In 1963, in Houston, it is. The book is extremely handsome--huge and heavy, it is packed with beautiful color reproductions of Dellschau's art. When I first saw this work, it reminded me a little of Adolf Wölfli's. The decorative borders and the use of repetitious patterns seem similar. However, these both may reflect the artists being influenced by graphic design conventions of their time. (Wölfli lived from 1864 to 1930.) As obsessive as Dellschau was, his work seems much less strange than Wölfli's. Dellschau has a light touch, and there are many humorous elements to the work. 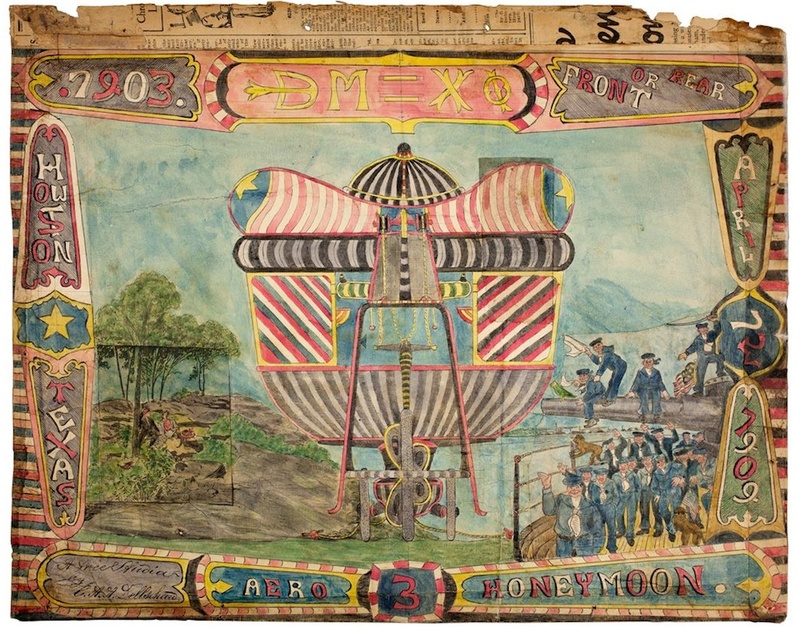 Over time, Dellschau incorporated collages of images and texts from newspapers and magazines in his books, especially when they had a relationship with flying machines. He was very interested in what was happening with aviation in World War I, for example. He called these clippings "press blooms." Whatever is problematic about the discovery/recognition of outsider artists, if the result is that I get to see big beautiful books about people like Charles A.A. Dellschau, I am for it. I find the category fascinating, especially as I examine the lives and work of artists like Forrest Bess and Charlie Stagg, who were not outsider artists but chose to isolate themselves to a certain extent from the art world in order to create better art. In a way, that is what "outsiders" show us--a different way to approach art-making. Thanks for the kind words on the Dellschau book Robert, it is very much appreciated. I applaud your effort here, particularly giving accolades to the late Thomas McEvilley for recognizing the work of P.G. Navarro, something self appointed Dellschau scholars have been extremely UN generous about for quite some time now, thank you for that.